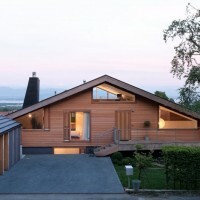 LRS Architects designed this home for a family in Genolier, Switzerland. 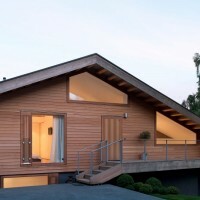 This single family house built in an area with strong zoning ordinances, diverts the vernacular language of the typical chalet into a playful and contemporary architecture. The topographical insertion, in a «plug-in» way, inverts the interior walk and the superposition of the functions. 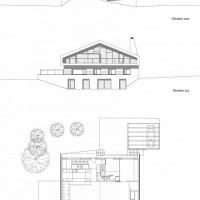 Reachable from the upper side of the plot, the living spaces evolves underneath the roof, facing the magnificient landscape of the Alps and Lake Geneva. 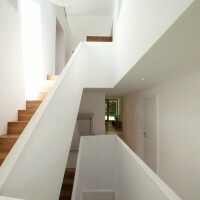 The intermediate floor with the parent and the children bedrooms offers a terrace. From the garden, the groundfloor is accessible with the innerpool and the workshop. 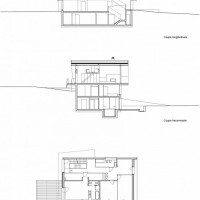 So to speak, this single family house get immersed into the topography and let us play with the perceptions and the variation of scales. 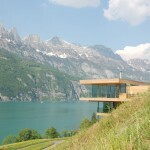 The relation between the inhabitant and the distant landscape (the lake and the Alps) and the nearby context (so are the garden, the terrace and the porche) is a central theme of the project. The utilisation of the larch gives a strong contrast with the mineral parts and the tiled roof introducing the stacking lecture. 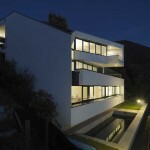 Visit the LRS Architects website – here.